SaveTheWAVE wrote: The only coasters I could see being open are B: TR, as its layout is the most “downhill” in the park, and V2. However, if there were more coasters open during HITP, how would that affect the maintenance schedule of the rides that remain open? I can't see V2 running in the winter. To me, if I was in charge of the park, I would keep V2 open. You aren't going to have a lot of coasters open during the winter. 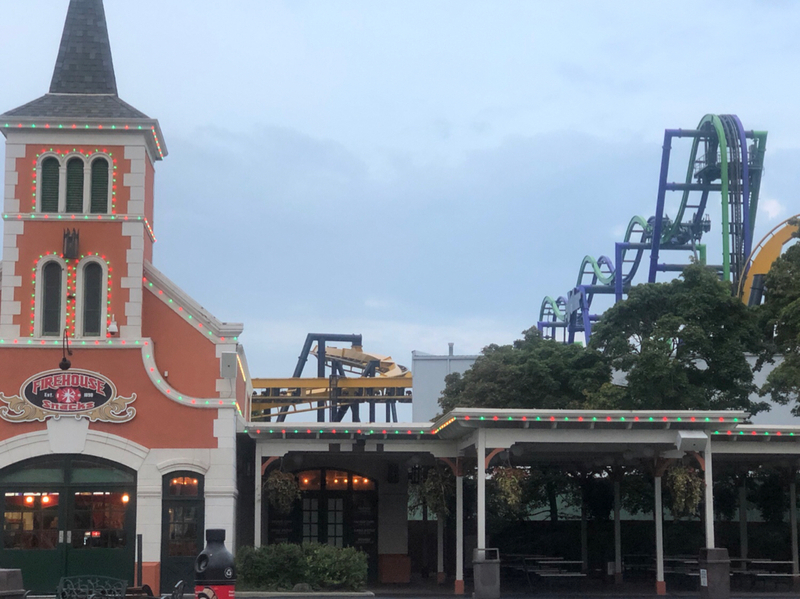 I know V2 takes a lot of maintenance during the off-season, but than you push that ride's opening later than in April 2019 (maybe middle of May 2019 than). It's makes more sense to shut down some other coaster that is going to valley in the winter, and start that off-season "early". The 3 I can think of are Goliath, Raging Bull, and American Eagle. At least 1 of those should start an early off-season instead of V2 because it just makes more sense. I am expecting all Huss Rides to be closed during this thing too. Ricochet problems in November of last year. Triple Play at St. Nick's Village closed in December. Kings Island doesn't open up their Troika. So, probably Revolution, and Condor would also be shut down. I can't see V2 open in the winter for whatever reason. Just doesn't seem like the ride that can operate in conditions like that...has a tougher time running in optical conditions, can't imagine if the conditions are drastic like in the winter. I don't know much about the maintenance side of rides and I won't act like I do, but I want Great America to be cautious with what rides they open during this event. Chicago winters can be brutal and I don't want any of the rides to develop any severe problems because of this. Only open the ride if for sure it'll be able to handle the weather. ^ I like your thought that makes sense. Not that I do not believe that, but have there been past experiences with rides/coasters suffering extensive downtime and or severe problems due to cold weather? Outside of SFGAm? _FuryBull_330_ wrote: I just had an epic idea of what the park could do. As you know every one knows that Terror Twister Two gives a legendary ride during Fright Fest but we won't be able to enjoy it anymore at the end of Fright Fest. Well I had the idea instead of removing the effects, you should keep them and instead of being Halloween themed you should have it Christmas themed. Don't shut off the lights at the beginning just put some Christmas lights at the beginning so it wouldn't scare children as much as it would. That's my idea that I'll totally share with the park. I love this idea!! Maybe have a way for fake "snow" to fall? Apparently just this part of the park is already celebrating Christmas! Photo credits to JiggidyNDG. This actually looks really good. From his other photos it looks like they might be doing some work to the deck in Yukon Territory too. Glad they're putting money into some upkeep, getting guests into the park is half the battle, making a good impression and getting them to return is the other half. Forget about the rides, for a second. I think the lights will be good and all, but I'm not expecting the most magnificent Christmas place ever. When I look at other Six Flags Christmas parks, they don't go all out. In my opinion, they don't have the decorations (other than just plain old lights). I hope they have the Christmas singing show like Fiesta Texas though. I now see Christmas lights everywhere. They even have lights on top of where the ticket takers are (that roof). Hopefully, that page is still just incomplete at this point. There is a christmas tree replacing the fountain in the queue. All lit up and beautiful. There are the sounds of carolers in the background and the whole area is decked out in lights and garlands. The statures up front are holding wreaths. You pass behind the park, and it's totally different. The joker has brought his mischief to Gotham. Inside the storm drain, there are stockings filled with dynamite and other weapons. Orange lights glow underneath you as if you are walking through a fireplace. Over the fan hangs a twisted banner that reads "Not a creature was stirring, not even a bat". Once inside the Batcave, things are mostly the same except for Black, blue, and yellow bunting that glows in the blacklight that has replaced the regular bulbs. TBH, it wouldnt be all that hard to pull off. People love the whole Merry/Scary Christmas thing. Look how popular The Nightmare Before Christmas is! Last edited by benneluke on September 13th, 2018, 11:56 am, edited 1 time in total. The Police car has now run into a demented steel jack-in-the-box with a jester head on a spring. There are "joker boxes" all around in the grass wrapped in green and purple paper. The christmas lights flicker and gnarly Poison Ivy garland hangs from the ceiling. The Police scanner tells of holiday themed crimes all over gotham, while creepy christmas music plays. That is absolutely... brilliant! lol. Hopefully they do something like that! ^ Wow! Great imagination and ideas!!! Somewhere, someone asked (the park) about what rides would be open and not be open, and it was a lot more than you would think. The thing on the website doesn't mean much. This might SOUND dumb to others, but it's important to me. No drinking water fountains because they don't have any indoors. You might say to me, but don't you know they have drinking water fountains at every bathroom. During last year in the colder part of November, they shut them all off because they are outside (freezing pipes), and not in the actual bathrooms. I like water fountains as compared to going up to a 20 minute line just to get a TINY cup of water. Somewhere in some location, they should think about adding some indoor water fountains because of now November, and December. In general, I'm for more water fountains at every 2 hour + place you go to such as amusement parks, water parks, museums, zoos, city parks, farms, baseball game, stadium, and even carnivals (Let's say they actually created PORTABLE drinking water fountains). Ilovthevu' wrote: Somewhere in some location, they should think about adding some indoor water fountains because of now November, and December. Honestly with the way Fright Fest was being run and what happened at last year's Last Call Fall Fest I still see this as an abysmal failure- more so because the Tribune had an article that as an incentive for coming to interview (not even get hired) you'd get a free ticket and another when you were hired... they need to fill over 800 positions and unless they hire a temp agency it is looking rather grim. Plus heard from a long time ride op that rides don't like cold weather so there's that too. Nice concept, would be better executed as Christmas in July! And seriously from watching the Great Christmas Light Fight they really should have put in pixels instead of led lights They can be any of over 500 colors so you could use them for more than just Christmas, Pastel for spring, sunset for summer, rainbow for pride, red white &blue for mem/labor day and the 4th, colors for mothers day,colors for fathers day, mardi gras colors they really missed the ball. That’s why I think V2 would be a perfect ride to run in cold weather. Electromagnets love the cold. The thing I worry about is the sensors acting up in the chilly air. However, I’ve been do FF on near freezing days, and it was running just fine. On Sunday there were Christmas lights everywhere. There were blue and white ones in Orleans Place. They even had yellowish lights on the trees in Goliath's queue. I think Goliath will be open for HITP. Do you think so too? ^R.I.P Fright Fest, they seem to have more Christmas decorations then Halloween Decorations now. About Goliath running during HITP I don't think so since it doesn't run great in cold weather and with cold weather there is the risk of valleying. Also it would be a health hazard due to the cold weather and can cause the human body temperature to go down significantly. The cold wind was blowing hard yesterday and it stung my face when I was running. So imagine how would it be if there is cold wind blowing in your face while going at 72 mph. Last edited by anewman35 on October 5th, 2018, 8:29 pm, edited 1 time in total. _FuryBull_330_ wrote: ^R.I.P Fright Fest, they seem to have more Christmas decorations then Halloween Decorations now. My guess would be the dive loop or stall. That’s where it almost stopped when we lost a wheel and the train was grinding metal. But again it’s so fast I can’t see it happening. My case was special circumstances. 45 days left until HITP they are advertising it in Hometown Square and near Sky Trek Tower. Can it be November already.